Sometimes there are days that you want to eat something else than you always do. 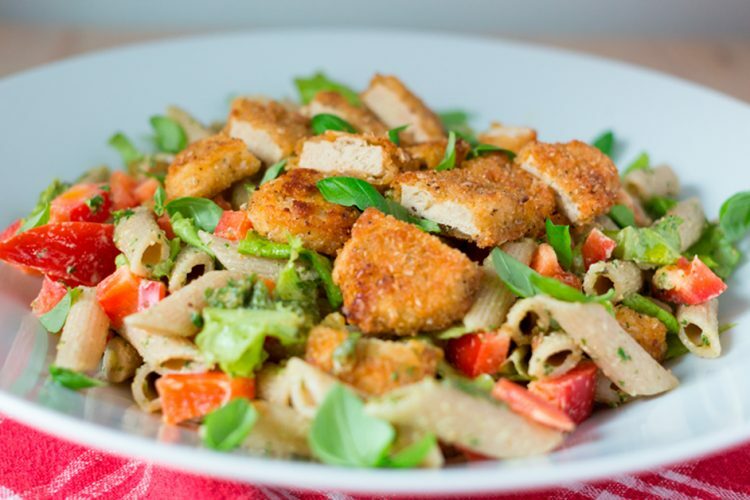 This chickenless crispy chick’n salad will be perfect for lunch. Yum! Prepare the 7 Grain Crispy Tenders as described on the packaging. Boil water and ad a pinch of salt and boil the pasta according to the descriptions. Rinse the bell pepper and salad before you chop the pepper and shred the lettuce. Cool the pasta with cold water when it is done. Mix the pasta with green pesto, olive oil, bell pepper and lettuce. Add salt and pepper to taste. Place the 7 Grain Crispy Tenders on top and serve. A simple and tasty dish, enjoy!